This is the latest smartphone from Gionee itself. Lets say hi to Gionee S6 Pro, a smartphone running on Android 6.0 direct from the box with Amigo OS 3.2. It came with huge 4GB LPDDR3 RAM, 64GB Internal memory, expandable memory up to 128GB with micro SD. With this kind of memory, i don't think you will ever see a lag on this smartphone even when playing big games on it or even multitasking. 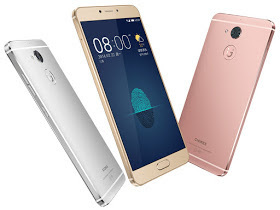 Gionee S6 Pro came with a Fingerprint Sensor, 13mp back camera with a Led Flash and also 8mp front shooter. 5.5inches screen display and 4G LTE enabled which is also supported with Ntel 4G LTE network. I really love Gionee smartphones in the sense of the battery durability, RAM and camera.